This is a page for tracking the effort to develop means for authors and publishers to indicate licensing and attribution requirements about web pages and media (e.g. audio, video, images) that they create and publish, possibly within the context of a still in-development media-info microformat. Document existing licensing-formats standardization efforts. While rel-license has successfully allowed publishers to semantically express licenses to their web pages since first introduced in early 2004, the need to express licenses for external resources and portions of web pages, as well as the possibility of expressing attribution requirements (if any) motivate the exploration of a new licensing microformat. The licensing microformat explorations are based on a licensing microformat discussion on 2006-10-05 between Tantek Çelik (Technorati) and Mike Linksvayer (Creative Commons) with a focus on the attribution requirements of Creative Commons licenses. 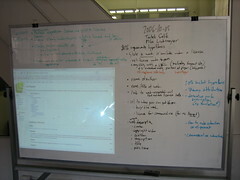 The whiteboard results of those discussions was captured in a photograph which is posted on Flickr. Credit identifying the use of the Work in the Derivative Work (e.g., "French translation of the Work by Original Author," or "Screenplay based on original Work by Original Author"). How to make a donation related to the work. rel-license outside any other microformat denotes a license for a web page at that granularity. media-info is a likely candidate microformat for including licensing and attribution information. CC Attribution license section 4 lays out legal attribution requirements for users of CC licensed works.